There’s already lots on the calendar for September, but we’ll keep this post updated when anything else comes up! You can try to keep up here, check DutchtownSTL.org/calendar, like our page on Facebook (facebook.com/DutchtownSTL), or follow us on Twitter (@DutchtownSTL) to stay up to date on events around the neighborhood. The Gravois Park Neighborhood Association and Dutchtown West Neighborhood Association both meet on Tuesday, September 12th. Gravois Park meets at 6pm at the old Jefferson Bank building on California just north of Cherokee. Dutchtown West meets at 7pm at Grbic’s banquet hall. The Marine Villa Neighborhood Association meets on Monday, September 25th, at Irish Corner Pub at the corner of Cherokee and Lemp. The meeting starts at 7pm and is preceded by the Chippewa Broadway Business Association Happy Hour starting at 5:30pm. The Mount Pleasant Neighborhood Association has their quarterly meeting on Wednesday, September 27th, at the Gretchen Inn at the Feasting Fox. They’ll meet there at 7pm. Dutchtown South Community Corporation’s So Fresh, So Clean, So Creative initiative has a couple of events in September. On Saturday, September 9th, is a workshop on the topic of healthy homes. Among other things, attendees will learn how to make their own environmentally friendly household cleaning products. The workshop is at 11am at the Thomas Dunn Learning Center. Thursday, September 21st, is another clean-up training session. September’s topic is vacant lots. City agencies will inform you about how to deal with garbage on vacant lots and what can be done with city-owned lots versus privately owned ones. The training is at the DSCC office at 4:30pm. There will also be various neighborhood blitzes and clean-ups in September. Follow us for announcements. Solidarity Economy St. Louis is hosting their first Reclaim + Sustain: A Food and Farm Weekend with the aim of bringing people together around the belief that everyone should have access to healthy, affordable, and locally-sourced food. They will be sharing and connecting with farmers, gardeners, business owners, chefs, holistic healers, educators, artists, community organizers, and anyone else who wants to be part of a food justice movement. 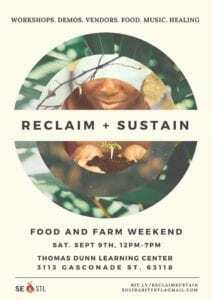 Reclaim + Sustain is at the Thomas Dunn Learning Center on Saturday, September 9th, from noon to 7pm. The Downtown Dutchtown Business Association has their regular board meeting on Tuesday, September 5th. Additionally, the Dutchtown CID Marketing Committee meets on Thursday, September 14th and the full Dutchtown CID board meets on Thursday, September 28th. On Wednesday, September 20th, join them for the DT2 After Hours. This month After Hours will be up and down Meramec for the Meramec Shop About. Stores will be staying open late. Make a purchase to be entered into a raffle. The prize drawing will be at 7pm at Urban Eats, where you can enjoy a special tasting menu, drinks, and live music. The Feasting Fox starts their Oktoberfest on Wednesday, September 27th, and runs through Sunday, October 1st. There are events every day at the restaurant, including live music, beer and spirit tastings, a German inspired beer and wine dinner and a German inspired brunch, and more. Some of the events recommend or require reservations or RSVPs, so please visit the Facebook event page for more information. 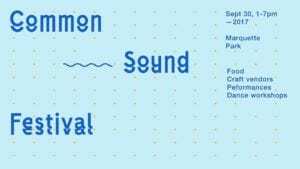 On Saturday, September 30th, at Marquette Park is the Common Sound Festival produced by DSCC and presented by Urban Chestnut Brewing Company. The festival will feature live DJs all day, free professional dance workshops, and 40 food and craft vendors. We also plan to break the record for the world’s longest soul train! Volunteers are needed for this event. Join your neighbors and the greater St. Louis community as we celebrate through dance and music the common sound that flows through us all. If you have or know of a neighborhood event in September or any time please let us know! Visit our contact page or email us at info@dtstl.org, Tweet at us, or message us on Facebook. This post was updated on September 9, 2017 . Read more news about DT2, Dutchtown, Dutchtown Events, Dutchtown South Community Corporation, Dutchtown West, Festivals, Gravois Park, Marine Villa, Meetings, Mount Pleasant, and So Fresh So Clean So Creative.